The world is constantly telling you that the path to a better life is more, more, more - buy more, own more, make more, f*ck more, be more. You are constantly bombarded with messages to care about everything, all the time. Look at this new thinner TV, buy a hot tub with an inflatable pool for the kids, get the Swedish furniture set to match that ab machine that doesn't work. Make sure to capture it all with the best selfie stick. Why? Because more is good business. This December, we're prescribing less. And while we're not against good business, Zen Magnets are not supposed to make your life more chaotic. Having your focus spread so thin - that the noise of decision paralysis drowns out the signals of imagination and ambition - is exactly what we don't want. When there are less parts to work with, there's a better chance everything will fall into place. A new presentation of 72 Zen Magnets, the collaboration of a dozen artists, and fully flushed with design guidance from Zen Labs. 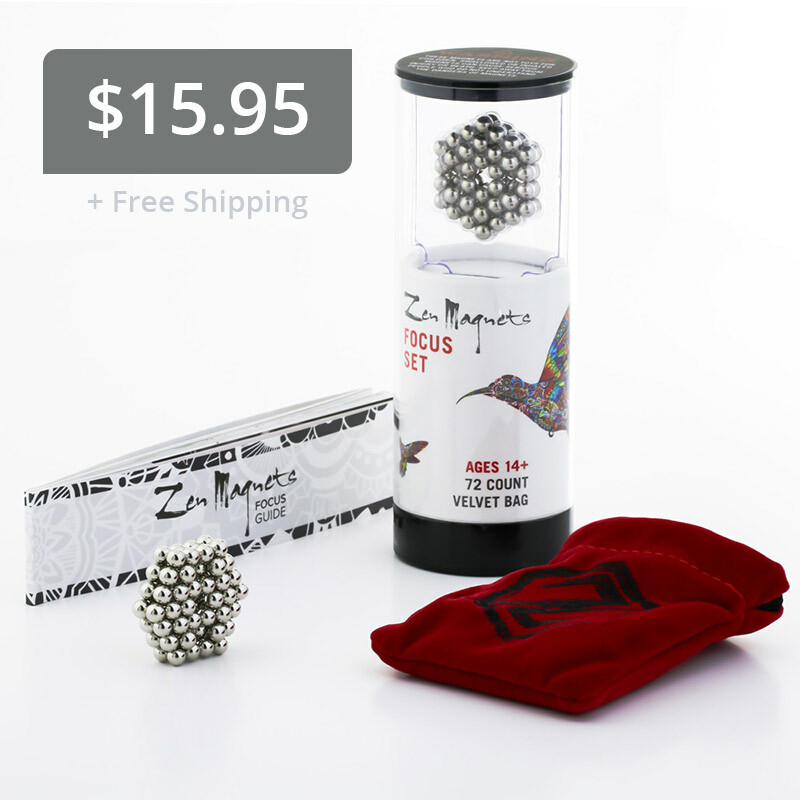 The Focus Set is an evolutionary leap towards the the most accessible form of Zen Magnets available, in terms of both price and functionality. Hidden inside the package is the classic embroidered velvet bag, as well as the new Focus Guide: 50+ pages of tutorials, tips, theory, and challenges. If your goal was to make a new shape every day, one full year later you'd find no difficulty avoiding repetition with 72 Zen Magnets. With fewer magnets, it's not only easier to stumble upon interesting shapes, it's easier to conceptually develop the subunits and techniques that can be scaled to larger structures. More than enough to get sentimental with. Even if the only experience sought is tactile sensation of having cold metal balls encompass your fingers, we hope the Focus Set will aid the perspective shifts sought by you and your loved ones. This first batch is on hand and domestic orders ship free via USPS First Class directly from our offices in Colorado. Order 3 or more for a free upgrade to Priority Shipping. As a limited time launch promotion, for buying one or more Focus Sets, we'll give you a 28% off coupon for your next order this year. The coupon will be delivered to your inbox within 24 hours of submitting your Focus Set order, and be valid for the remainder of December on anything we sell except for Focus Sets. You're still here? Update your email preferences if you want more details about the legal battle, notifications about contests, or want to be part of our labs group.